We provide download of our entire WHOIS database in CSV format. You will receive WHOIS record of all the domain names we have ever monitored. We provide parsed WHOIS data of newly registered domains as daily downloads. Each day you will receive newly registered domain names, along with it's whois records. We provides country specific whois database of US, UK, Canada, Australia, India, France, Brazil, Germany, Spain, Russia, UAE & many more separately. 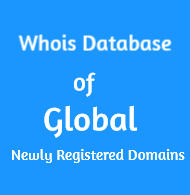 Each whois database download contains list of newly registered domain names along with their whois records. You also get instant access to newly registered domain database of previous 30 days when you subscribe. Feel free to contact us at for any issues you have with our products. Simply enter a domain name below to check it's current WHOIS data and ownership information. Note* Any Subscription made in between 8.30 AM to 1.00 AM (GMT/UTC + 5:30h), we provides data access with in 30 minuts. If you made any subscription than we provides data access after 8.30 AM (GMT/UTC + 5:30h). 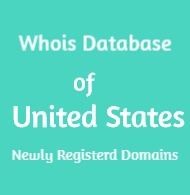 Whois data of US updated daily. 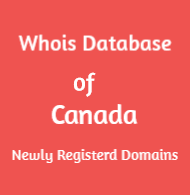 Whois data of Canada updated daily. Whois data of all countries updated daily. 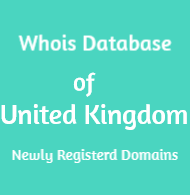 Whois data of UK updated daily. 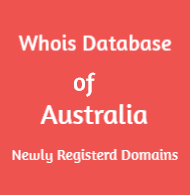 Whois data of Australia updated daily. You want answers. As a security specialist, it is your job to gather facts and discern the truth of who people are and what they are trying to do. Carrying out this mission in the virtual realm is not always easy. But there are tools available to help you. A Whois database download will provide you with a sound, solid, and reliable method of verifying domain names. Domain name registrants must be held accountable for their actions. Using a Whois database download will allow you to combat spam and uncover attempts to de-fraud or scam your organization. If you work as a private security research contractor or you do the same job attached to a large company, you can protect your clients by finding out all that you can about online entities that have sent emails, posted messages, and delivered other digital items to your employer. You can also track down domain name registrants who post illegal content on your company’s site, send you excessive amounts of spam, or engage in phishing scams. The Whois database download is very easy to use. All you need to do is enter the domain name or names you are after and you can retrieve data about it, including whether the name is taken, the owner of the domain name, the date it was created, and when it is set to expire. The data obtained from Whois is fairly accurate. Domain owners are required to update and edit the information in the database annually. Failure to do so can lead to the suspension or cancellation of the domain name. The latter is also a penalty for anyone caught falsifying information. Certain companies base their entire strategy on their ability to be discrete. However, that does not obviate your need to keep your clients safe and their site free from clutter, attack, and fraudulence. The Whois database gives you a window inside domain registrants around the world. Depending on the background or security check you have been tasked with, you can conduct your search according to parameters that you establish. You can search registrants by country or you can go by newly registered or expired domains. It kind of search that you will want to do regularly will determine the cost of your package. You can also use the Whois database to protect your own company’s domain name. Using it will allow you to identify trademark infringement. You will also be able to detect any attempt to use your company’s domain name for marketing or publicity without your permission. Preserving the reputation of your brand is never-ending business. The larger and more successful your company becomes the bigger target it will become for unscrupulous people. There is much that you will have to do to defend your clients against such attacks, and most of the work will begin with identifying who and what is trying to penetrate your site to do harm or use your domain name in an illegal and unethical way. The Whois database can help you meet that challenge. WhoisDatabaseDownload.com has been gathering domain Whois records for almost all Tlds, gTLDs and ccTLDs. This whois data is well parsed and accurate and provided through real-time APIs, WHOIS Database Downloads, and online tools. We support all Domain Extensions (Tlds, gTLDs and ccTLDs). You can now purchase domain extension specific of domain names with our WHOIS database download. Whois Database Download provides partial or complete historic domain Whois information, which can be customized as per your business needs. We provide download of our entire WHOIS database in CSV format. You will receive WHOIS record of all the domain names we have ever monitored. Each record will contain all parsed fields of the domain's WHOIS information. For reference, you may download a sample of our Complete Whois Database. For any Subscriptions made in between 8.30 AM to 1.00 AM (GMT/UTC + 5:30h), we provide data access within 30 minutes. If you make any subscriptions after that we provides data access after 8.30 AM (GMT/UTC + 5:30h). We also provide download of country specific whois database of United States, United Kingdom, Canada, Australia etc on a daily basis with their whois information. Every day we update newly registered domain names, along with their whois record containing contact details (Name, Email, Phone & more) of the domain owner, whenever available in your customer panel. We have attractive offers if you purchase multi country specific database. Please, check our multi country packages. Subscription is valid for 30 days, It will automatically renew every month until cancelled. You may stop the automatic renewal any time you wish. Once stopped, your account will be terminated after it expires. For any queries, please contact us. 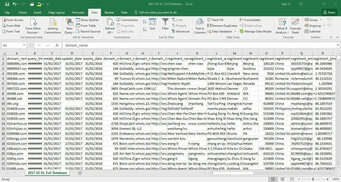 In this below listed whois database we provide download of our entire WHOIS database in CSV format. You will receive WHOIS record of all the domain names we have ever monitored. Each whois record containing contact details (Name, Email, Phone & more) of the domain owner, whenever available. The full database is divided by month, that means you get month wise data of your selected country. After payment files will be delivered within 8 hours, if you want to get the data first just drop an email with payment confirmation, we will try to provide the files ASAP. For testing purposes, you may use the free samples of whois database for expired and registered domains listed below. We restrict our newly registered domains with whois database for paid users only. If you want fresh and updated newly registered domains database on daily basis please visit Newly Registered Domains. WHOIS isn’t an acronym, though it may look like one. In fact, it is the system that asks the question, who is responsible for a domain name or an IP address? In which format will I receive the download file? You will get ZIP files containing all the WHOIS records in CSV format. How long does the delivery of Newly Registered Whois Database take after payment? After payment it takes 5-8 hours to activate your account. After that you receive an email containing login details of whois database download. For support issues, contact and we will get back to you within a day. For support issues, contact and we will get back to you within a day. After payment it takes 5-8 hours to activate your account. After that you receive an email containing login details of whois database download. For quicker access to our database please contact us. © Copyrights Whois Database Download 2017. All rights reserved.